Every house has doorknobs. Every house will have floors and lights and counters and toilets. What makes all the difference, then, is the care taken in choosing the standard features that will finish out a house. We go to great lengths to ensure Southern Serenity homes are constructed and appointed — from the inside out, from bottom to top — with top-quality materials so that home buyers know from floor-plan to floor-plan the level of standard features they can expect. The trick is to accomplish this without a resulting cookie-cutter feel and we excel in this strategy. Our choices also set the standard for the homes in the community in which we build and in which you are making an investment. All homes feature a luxurious trim package with extensive crown and shoe molding and ornamental millwork. Beautiful hardwood flooring extends from the entry throughout the kitchen and dining areas, the great-room/hearth room and all hallways, with bedrooms boasting high-quality, stain-resistant and anti-static carpeting covered by a 20 year warranty and guaranteed against manufacture defects. Stained wood treads on the staircases, complemented by wrought iron handrails, also feature lighting at step level for safety. Rounded (or bull-nose) corners give a soft, finished feel to the walls that rise to smooth ceilings. Depending on the floor plan, the ceiling height will dictate the door height: 8-foot doors for 10-foot ceilings, 6-foot 8-inch doors on 9-foot ceilings. Vaulted or tray-style ceilings may feature recessed can lighting which is also found in the hallways, great room and kitchen. Lighting elsewhere includes pendulum fixtures over the kitchen island or breakfast bar, with custom lighting packages available, and ceiling fans with light kits can be found throughout. Often the centerpiece of the living area, our brick or stone fireplace (a 42-inch low-profile ventless) is not only designed for functionality, but is configured with technology in mind; discreet pre-installed PVC pipe hides television and entertainment system wiring to the flanking shelves. A floor outlet in the great-room is an option, and decorative switchplates and wallplates are used throughout. Our homes are wired with Cat 5 phone lines in the kitchen, great-room/hearth room, all bedrooms and, of course, the game room with surround-sound standard in the media room. In the kitchen, granite counters are featured in the bumped and staggered custom self-close cabinets, with the island mirroring the fireplace facade materials. The granite counter tops continue into all baths as well as the laundry room, which contains a utility sink and space for a freezer, if applicable. The bathrooms feature comfort height elongated toilets and tile-surround showers with beveled mirror trim in the master bath and furniture-style cabinets in the 1/2 bath. 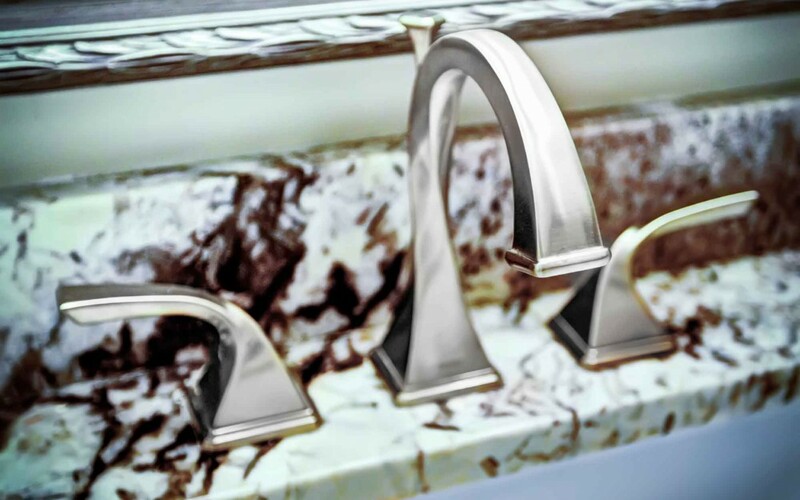 All hardware comes in a choice of oil rubbed bronze or brushed nickel finish. Every home comes with an appliance package that includes: a Frigidaire Stainless Steel cook-top with custom cabinet Vent-A-Hood, double oven, dishwasher, microwave and 1/2 horsepower disposal; a tankless gas water heater and gas furnace; a Carrier High Efficiency 14 seer HVAC unit and programmable thermostats; and a 1/2 horsepower garage door with three remotes and an external key pad. Safety features run from a fully operational security system with two keypads (coverage on all operable windows and doors downstairs) to deadbolt locks on all entry doors. All Southern Serenity homes boast a 10-year structural warranty. Each one is constructed with a floored attic on 16-inch centers, resulting in a more structurally sound building. We use TechShield Radiant Barrier roof decking, which ensures that the attic space temperature is never more than a difference of 8-10 degrees from the rest of the home, thus lowering cooling costs. We use 30-year architectural shingles on the roof, which will also have rain gutters, downspouts and splash blocks. From luxury front yard landscaping, front and rear flood lights and a rear patio, from screens on all operable windows, the wrought iron mailbox and 3-car garage, you can rest assured we have made carefully considered decisions regarding the standard features in the homes on which we put our name. Walk into any of our model homes and know that what you see there is what you’ll get in yours. Upgrades are available, of course, and guided by the builder new homeowners con be confident that they are getting the maximum value for their investment.